At Simris, we produce and deliver “algae supergoodies”, natural food products from farmed algae. The algae we grow at Simris are tiny microscopic marine plants, that are packed with healthy nutrients. These algae naturally produce vitamins, essential fatty acids and antioxidants, which are essential for our health and wellbeing. It is our mission to harness these substances, and to deliver highest quality, premium products that give our customers access to these sun-packed gifts of the sea. As part of the Simris philosophy, for us health and the environment are interrelated. We believe that the food and health products we eat to keep us healthy and strong, should not cause depletion of natural resources, and should of course be pure and safe: free from environmental toxins and pollutants. At Simris, we have committed ourselves to making a difference in the omega-3 industry. This is why we produce Sweden’s first exclusive, locally farmed, environmentally friendly and plant-based marine omega-3 from natural algae. Our cultivation is based on a multiple award winning innovation, that we have developed ourselves. As a result of our love and fascination for algae, in addition to our omega-3 supplements, we have also developed a line of nutritious and supreme food products, all based on different types of algae. We hope you will be as inspired as we are! +- Where can I buy your products? If you live in Sweden or the EU, you can buy our supergoodies online via our Simris EU webshop. You can also visit one of our stockists: Simris Stockists. If you live outside the EU, please visit our Simris Global Webshop. We add new countries every week, so make sure you check in frequently, or drop us a line if your country is not on the list yet. +- What kind of algae do you farm? The algae we grow at Simris are microalgae that, unlike seaweed or kelp, are invisible to the naked eye. They do not grow by getting bigger, but by proliferating into growing numbers. Our algae naturally have a very high content of omega-3, the same omega-3 as in fatty fish and fish oil. It is from these algae that the fish gets its omega-3 to begin with. You can read more about algae here. +- Are your products organic? Organic certification criteria for modern algae farming has not existed in Europe before November 2017. Our farm has always operated under strict environmental policies and we make sure our operations are in harmony with nature and the environment. We are currently in the process of obtaining the organic certification for our algae and this will be finalised shortly. Algae aside, most ingredients in our products are certified organic, where applicable. +- Are your products suitable for vegans? Yes. All our products are 100% free from ingredients of animal origin. This includes our entire production chain. Our products are registered with the Vegan Society. +- Are your products GMO-free? All Simris products are guaranteed free from GMOs or so-called “industrially evolved strains”. We only grow natural algae. Also, our products are free from environmental toxins. 100% pure, natural and safe! +- Why do you use flaxseed oil in your capsules? Flaxseed oil is a great source for a-linoleic acid, or ALA, the third omega-3-fatty acid. Therefore, we use flaxseed oil to increase the total amount of omega-3 in our products. This extra omega-3, in addition to the algal EPA and DHA, supports a healthy omega-6/omega-3 ratio. Due to its high omega-3 ALA content, we think that flaxseed oil is a superior choice to olive oil, canola oil, or sunflower oil. +- Why do you use sunflower oil in your capsules? Some people are concerned about the omega-6 content in sunflower oil. Omega-6 fatty acids are also essential to our health, however, most modern diets include too much omega-6 in comparison to omega-3. The amount of sunflower oil in our capsules is really tiny – no more than 1/10 per capsule. The sunflower oil is part of the DHA oil we are currently sourcing from a European supplier. +- Why do I need omega-3 from algae when I eat flaxseed oil or chia seeds that also contain omega-3? The omega-3 found in land-based plants and sources such as flaxseed oil, chia seeds and similar, is ALA (a-linoleic acid). ALA is great in ensuring a healthy omega-6/omega-3 balance, so keep on munching on those seeds! However, other biological functions require omega-3 EPA and DHA. Extensive research has shown that the conversion of ALA into the active omega-3 forms EPA and DHA is rather inefficient, around 5%. Supplements with omega-3 EPA and DHA ensure sufficient intake of these essential fatty acids. Learn more about omega-3 fatty acids here. +- What is the difference between the three omega-3 products? Simris® Algae Omega-3 and Simris® Algae Omega-3 for Athletes contain both EPA and DHA omega-3s. Simris® Algae Omega-3 for Mothers contains DHA omega-3. 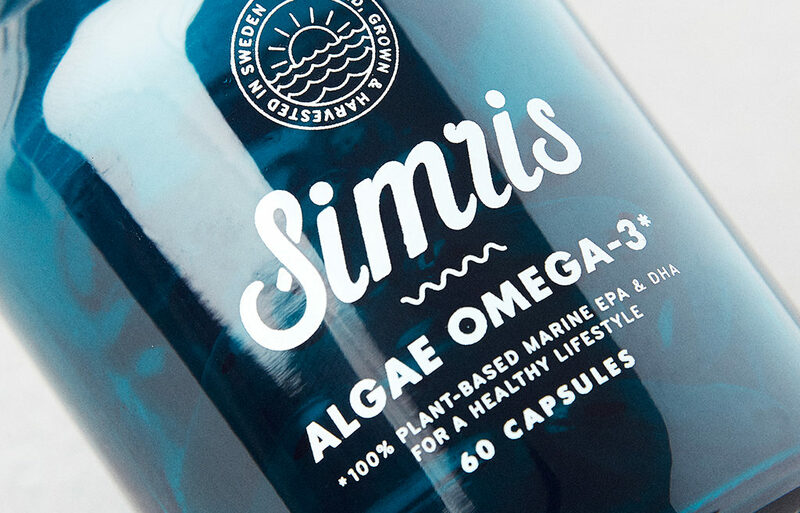 Simris® Algae Omega-3 for Athletes contains an extra boost of the antioxidant astaxanthin. +- Which omega-3 product should I give my child? All our omega-3 products are safe for children 2-18 years old. Omega-3 DHA is particularly important for brain development, thus Simris® Algae Omega-3 for Mothers is a particularly good choice for kids. +- What is the difference between chlorella and spirulina? Chlorella is a green alga rich in chlorophyll. Spirulina is a blue-green alga that is particulary rich in protein. Both are excellent nutritional choices!